In the old Nature Religions (in which the Divine was often perceived as Feminine) it was the FEMALE Horned Reindeer who reigned supreme as the ‘Great GODDESS of the Winter Solstice’ in the Northern Hemisphere. It was when we “Christianized” the pagan traditions of the Northlands Winter-time, … that the white-bearded man known today as “Father Christmas” and “Santa Claus” was born. 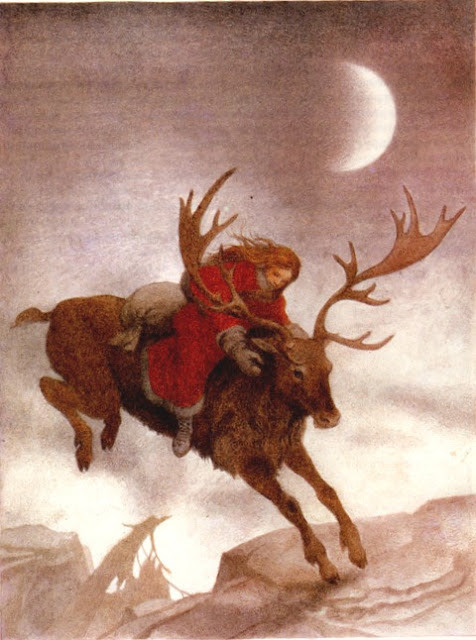 Today he chariots ‘Rudolph’ and his other ‘Steeds of flying Reindeer’ across our mythical skies … but we have largely forgotten the power of the Deer MOTHER, … the FEMALE horned Reindeer. Stronger and larger than the buck, it is SHE who leads the herds during the cold dark Winter’s Night. SHE does NOT lose HER horns as does the male, … She continues to carry them as Protection, both during and after giving Birth to the New Generation in early Spring-time. And it is HER beloved image that adorns the ‘Christmas cards and Yule-tide Decorations’ we are All so familiar with today. Because, unlike the male deer who sheds his antlers in Winter, … in Northern Hemisphere Mythology, it is the ‘Deer MOTHER’, who also carries and protects the life-giving ‘Sun-LIGHT’ as SHE safely travels through Winter’s darkest and longest night, … held safely in HER Great Horns. Across the North Land, … and since the Neolithic Times ~ from the British Isles, to Scandinavia, on to Russia and into Siberia, across the early Land Bridge of the Bering Straights of Alaska, and further on down into the Americas ~ the FEMALE Reindeer was venerated as the ‘Life-Giving MOTHER’. SHE was the ‘Majik of Fertility’, the ‘Anima’ (Sacred Soul) of all the Wild Places, the Forests and Mountains, … and the otherworldly ‘Steed of the Fairies and Magical Folk’ found living around the Northern Pole. HER Horns adorned Altars and the Heads of Shamanic Priestesses and HER image was etched in Standing Stones, while being woven into Ceremonial Cloth and Clothing, and Cast into Jewelry, and Painted on Ceremonial Drums. Rarely depicted running on the land, the Reindeer was seen ‘leaping or flying through the air’ with neck outstretched and legs flung out before and after. 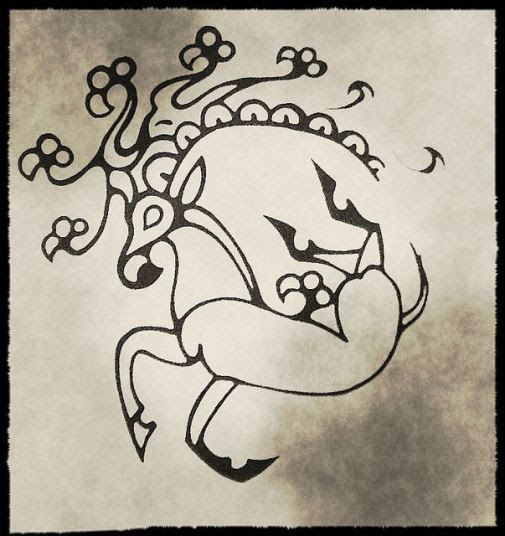 Often carrying the entire Cosmos, the Sun, Moon and the Stars in HER Great Horns, … HER antlers were depicted as the ‘Tree of Life’, showing the Lower, Middle and Upper Worlds. The ‘Deer Mother’ has also been visualized as a seated Woman/a GODDESS, wearing a Horned Headdress into which is woven the ‘Tree of Life’ and the Bird (emblematic of shamanic flight). This Trio of Symbols is often repeated in the Winter Solstice Imagery of the Northland and their on-going Christmas ‘Folk Art’ ~ and it is still with us today, … although we have clearly forgotten much of it’s original meaning. There are unsupported theories that today’s ‘Santa Costume’ derives from the Native Shamans in the Arctic Regions who would dress themselves in ‘Red Suits with White Spots’ ~ in imitation of, and while collecting these ‘Majik Mushrooms’ ~ and then … they would deliver them as gifts through the ‘Chimneys and Smoke-holes’ of the Tribal Dwellings of their group ~ as ‘Sacred Gifts of Vision’ shared with the whole Tribe on the Winter Solstice. In Siberia, FEMALE shamans wore ‘Red and White’ costumes trimmed with fur, horned headdresses (or felt Red Hats) and practiced the tradition of ‘Shamanic Flight’, also. And most likely it is their Winter Solstice Celebrations that brought us the stories of ‘Flying Reindeer’ who take to the sky with ‘Grand Father Frost’ or ‘Santa’ on the ‘Longest Night’ of the Year. 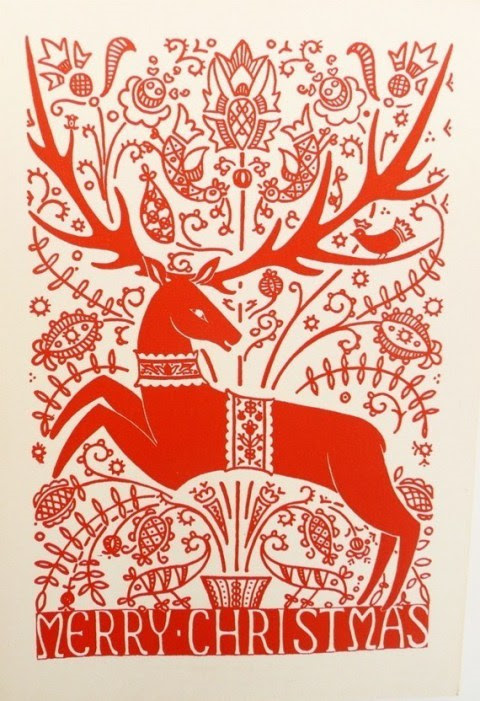 ‘Rozhanitsa’ was the Antlered Winter GODDESS of Russia and on HER feast day (held during the Winter Solstice) red and white embroidery depicting HER was displayed along with small white cookies shaped like deer that were baked and shared with All as good luck tokens. ‘Saule,’ the Slavic ‘GODDESS of LIGHT and Family’ flew across the Heavens in a Majik Sleigh pulled by FEMALE Reindeer as SHE threw pebbles of ‘Amber’ (symbolizing the SUN) into people’s chimneys. And so, … as this Winter Solstice of 2015 is soon to be upon us, Remember to look out from your warm and cozy home into the cold nighttime of the darkening eve. Also remember the almost completely forgotten Wintertime ‘GODDESSES of Old’ and their Majikal Reindeer.’ Who on that Sacred Solstice Night, … when the SunLIGHT is returning as ‘Reborn in the Northlands’, … SHE can be Connected with, Looked for, and Honored as “Mother Christmas” ~ while waiting silently as a FEMALE Deer in the forest, the ‘Temple of MOTHER Nature.’ We see HER as SHE is carrying a bird in HER Great Horns in honor of a ~ “Flight of NEW Vision” for our “World in Unity Consciousness.” So BE IT! … and, So It Is!